Nepal Foreign Affairs (KATHMANDU, 16 January 2019) – Prime Minister KP Sharma Oli has said he was for the economic prosperity of the country, but not for squandering time by holding topmost executive post of the government. “I’m committed to remarkable development in the country,” the PM vowed. 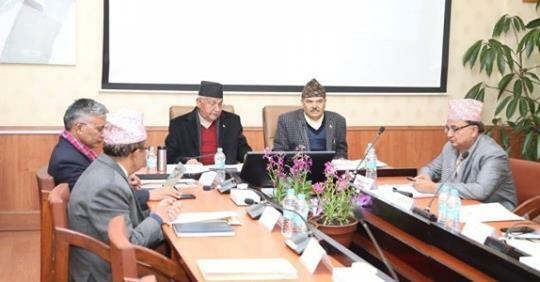 Now onwards, Nepal will be known as the country of intellectuals rather than of workers, he said, adding that the federal, provincial and local levels will foster more coordination for the development programmes because 12-point note on inter-state facilitation was being enforced for the implementation of the federalism. He further emphasized that the various bodies and departments under the government need to establish proper coordination and work in unison for people’s welfare and development. According to him, the government has not only garnered two-thirds majority, but also carried clear vision and policy stability. So, equitable and prosperous Nepal is the motto. “The scientific form of socialism is prosperous Nepal and happy Nepali,” he argued. As the PM said formulation of new laws and amendments were going on to fully implement the constitution. Special efforts would be made to implement the very ambitious but practical project and digital Nepal would be made a reality, he further shared. The government would utilize the amount in the rural telecommunication fund for ensuring citizen’s access to information technology. Modernization of agriculture, development of tourism, people’s access to basic health service are other priorities of the government. In the meeting, PM Oli directed all concerned not to delay service to people, and complete development projects on time. “The capital expenditure is not satisfactory despite the early budget,” he reminded, directing the ministries and officials not to repeat such in the coming days. Moreover, the PM shared that adjustment of civil servants was going on smoothly. After the completion of the adjustment, it would address civil servants’ grudges.